This 91,000 s.f. medical office building offers the latest in both medical technology and environmentally sensitive design. It houses several large medical practices including an Immediate Care Center, an imaging center with MRI and CT Scan equipment, and a breast center. At the project’s outset ESA looked closely at how to make the new building as energy efficient as possible and to ensure significant long-term savings for the owner. By siting the structure to maximize sun exposure, they enhanced the patient experience while reducing heating and lighting costs. Conversely, they incorporated sunscreens into the façade and used tinted glass to decrease solar load during the hot midday sun. Consideration of energy savings extended to lighting as well. 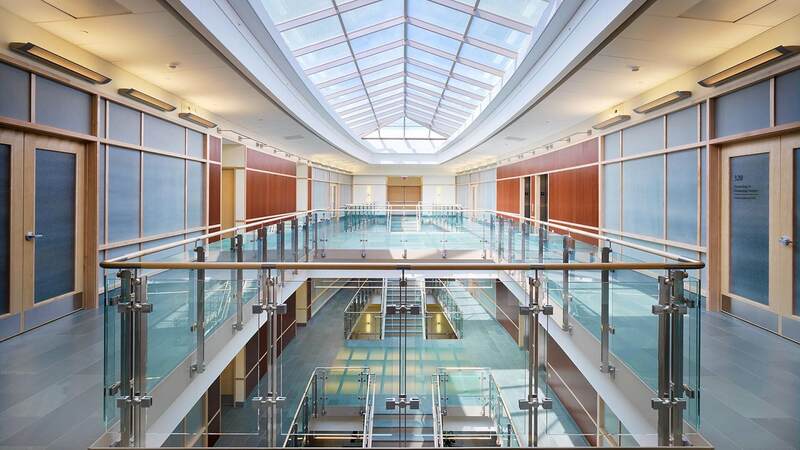 A large skylight over the two-story atrium brings daylight into the heart of the building, and advanced controls adjust for different degrees of natural light. Motion sensors control lights in clinical spaces and exam rooms. State-of-the-art heating and cooling systems, coupled with a well-insulated roof, maximize energy and cost savings. The evaporative cooling rooftop units consume 40 percent less energy and the condensing boilers are 10 percent more efficient than standard systems. The building’s annual energy consumption is 30 percent less than a normal building of its size and type.